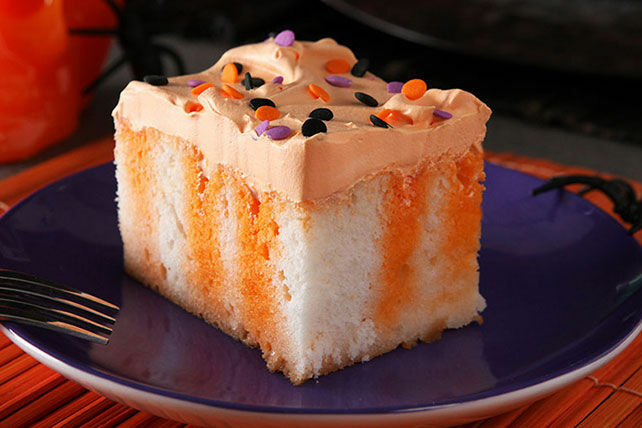 No broomstick required for this vanilla- and orange-flavoured Halloween Poke Cake. An ordinary fork should get the job done. Prepare cake batter and bake in 13x9-inch pan as directed on package. Cool cake in pan 15 min. Pierce cake with large fork at 1/2-inch intervals. Add boiling water to dry jelly powder in small bowl; stir 2 min. until completely dissolved. Stir in cold water; pour over cake. Refrigerate 3 hours. Tint Cool Whip with food colourings; spread onto cake. Refrigerate 1 hour. Decorate with sprinkles just before serving. If orange food colouring is available, use that instead of the yellow and red food colourings. Add enough drops of food colouring until frosting is of desired shade.